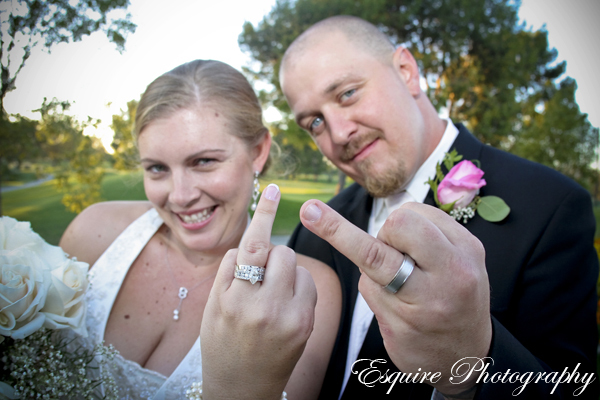 Let me just say that if you ever ask a bride to show you her ring, you might get the finger. Well ok, not “that” one, but you’ll get one in your face. I think that the series of photos we did after Allison gave me the finger pretty much sums up how much of a funny bone both Allison & Josh have in them. Their wedding was held at the Rio Hondo Golf Club in Downey, California. I’ve been there before, but not as a photographer, but as as guest. And, I can now tell you from experience both in front of the camera & behind that they know how to keep the glasses full throughout the evening as there was no shortage of “cool libations” for Allison & Josh’s guests. The day started off with the guys turning a traditional photoshoot into more of comedy hour. And, the rest of the wedding day pretty much followed suit! Here are just a few samples of how much fun we had from their day – cheers!